AT&T made $30 billion in profits last year and just received a $20 billion tax cut from the Trump administration. The telecom giant lobbied aggressively for the tax bill and CEO Randall Stephenson even went on the record with promises to invest in his workforce and create at least 7,000 jobs if it passed. Instead, the company announced thousands of layoffs while it continues to send work to low-wage contractors and jobs overseas to at least eight other countries. AT&T workers are fighting back. 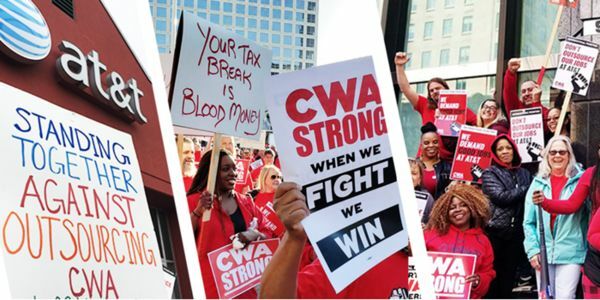 Communications Workers of America members at AT&T Midwest and AT&T's national Legacy T division are fighting for fair union contracts and have voted to strike if necessary to secure a deal that guarantees good jobs, affordable healthcare, and a secure retirement. If it wants to maintain its credibility as a responsible corporation, AT&T must stop destroying good jobs and betraying workers who have dedicated decades of their lives to an employer they believed in. Stand with workers and tell CEO Randall Stephenson that you support good jobs and a fair union contract for working people at AT&T! I support good jobs and a fair union contract for working people at AT&T.